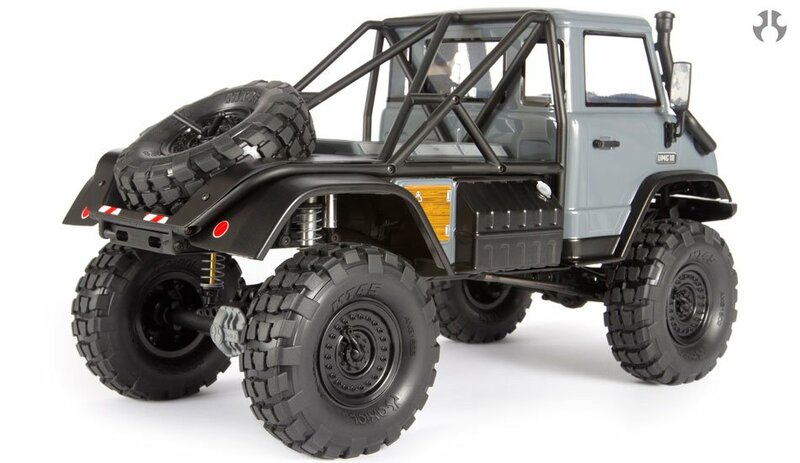 Axial announced that the new SCX10 II UMG10 4WD rock crawler kit is coming soon. The 1/10 scale Axial UMG10 kit tops off its unrelenting SCX10 II chassis with a forward-cab body based on full-size machines that pull hard duty in the world’s most rugged and remote regions. Its off-road performance more than does justice to the vehicles that provided its inspiration. Military-style features include 1.9 MW19 beadlock wheels and 1.9 MT45 tires in R35 compound that deliver all-terrain traction. The UMG10 also has a full-scale truck’s aggressive approach and departure angles for impressive climbing ability over rocks and steep tracks. Its body and cage are bolted together and hinged to the rear of the chassis. They tilt up as one piece for easy access to on-board components. Complete the kit with your favorite radio and electronics and prevail on any trail! Let’s check out the video now! A total of eight mounting locations for LEDs are found throughout the vehicle. Four lights can be mounted in the front grille, two in the front bumper, and two in the rear frame plate. NOTE: LED lights are not included. The realistic molded plastic grille features details such as a radiator, an embossed Axial logo, two clear marker lenses, and two headlight lenses. The pinion gear is 6mm above center, this allows for added ground clearance and better driveshaft angles. The high pinion design has increased surface contact for increased durability. AR44 front and rear axles feature a single-piece design with molded truss for extreme durability. Integrated C-hubs and lockouts offer optimized performance as well as improved ground clearance. Universal joint axles, helical cut internal gears, and high-quality bearings are all standard equipment. The ring gear/locker is a single-unit piece made of strong sintered metal, and the pinion is CNC cut for durability. Supplied exterior details that bring the realism to life include molded plastic mirrors, a snorkel, door handles, and windshield wipers. The spare tire isn’t just a scale replica! The UMG10 kit includes a functional MT45 spare tire mounted on an MW19 beadlock wheel. The rear cage has a spare tire carrier plus a hinge system that offers easy access to on-board components. You can quickly reach the battery and chassis by removing just two body clips hidden under the cab. Scale looks on the outside, genuine Axial gears on the inside! The SCX10™ transmission received a design makeover with special attention paid towards aesthetics by mimicking a real transmission with a bell housing, oil pan and a 4X4 transfer case! And that’s just the beginning. By sitting the transfer case lower into the chassis and centering the driveshafts with the axle input housings, Axial has created a more efficient driveline with better driveshaft angles which puts less stress on moving parts. Better driveshaft angles coupled with hi-pinion axles IS scale realism backed with performance. Also includes full set of ball bearings and all metal internal gears for strength and durability. OPTIONAL: For a functional low/high speed transmission, install the optional 2-speed gear set (part number AX31440 — requires an additional servo for the steering fork). The all-metal internal gears of the proven SCX10™ transmission provide lasting strength and durability. The adjustable battery tray is located low and in the forward position for better weight distribution and center of gravity (COG). Scale matters, but so does geometry! In pursuit of scale looks, we’ve moved the servo off the top of the axle and onto the chassis, just as a full size truck has its steering box located on the frame. But with this seemingly simple action comes a complexity of suspension hurdles to overcome – one of which is bump steer. The undesirable steering is caused by bumps interacting with improper length or angle of suspension and steering links. We made it our mission to design the front suspension in such a way that it eliminates or comes as close as possible to zero bump steer, to help give you the best driving experience possible.